Grooved Couplings by Kuriyama are used in conjunction with grooved end pipe or hose connections. 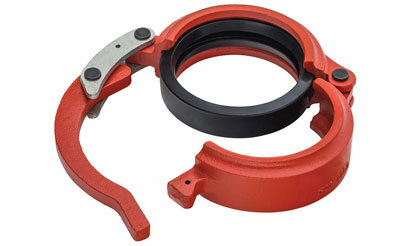 The orange colored, ductile iron couplings are supplied with plated nuts and bolts with all sizes. The quick release version provides faster connecting and disconnecting of hoses or pipes and is supplied with a steel safety clip to prevent accidental opening. Click here for more info.